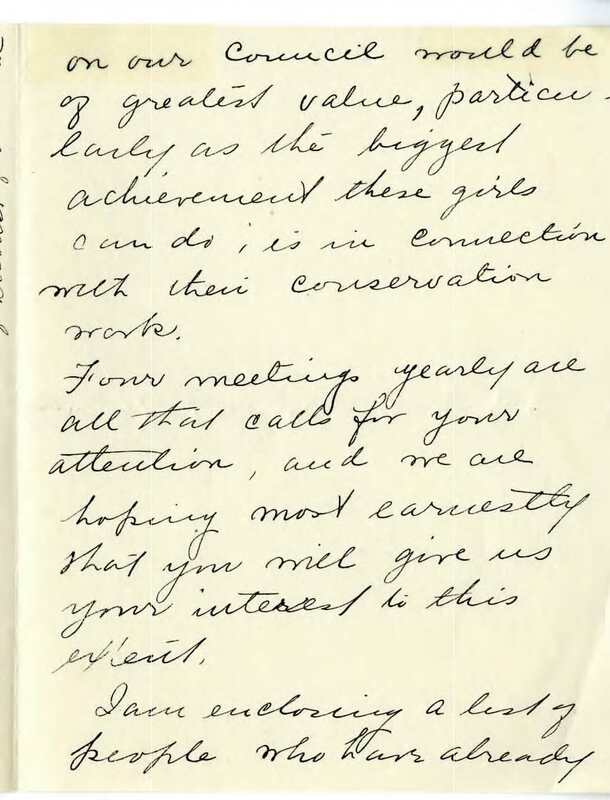 You might assume that the Girl Scout Council of Washington, DC, began with a formal meeting of prominent women concerned with youth issues. Perhaps Juliette Gordon Low trotted across Pennsylvania Avenue from her office to meet with the first lady at the White House. But in reality, the Washington Council was the product of an auto accident, a case of appendicitis, and a brief kidnapping. The first Washington DC troop formed in December 1913. With the national headquarters located in the Munsey Building, near the White House, national staff initially handled matters related to local troops. But when JGL moved the headquarters to New York City in 1916, Washington Girl Scouts had to take charge of their own affairs. With more than 50 active troops, it was time to get their files in order and apply for a charter. The first question was who would be the commissioner (president) of the DC Girl Scouts. The obvious choice was Lou Henry Hoover, an old friend of Daisy’s, but she was too busy for the amount of work necessary to seek a charter. After thinking about civic-minded women in Washington, she came upon the solution by accident–literally. In 1916, Mrs. Hoover had been in a fender bender with Henrietta Bates Brooke. Mrs. Brooke was well known in Washington for her various charitable endeavors. She had met JGL years earlier in Savannah and seemed ideal. Mrs. Hoover called on Mrs. Brooke, only to find her confined to her bed with a severe attack of appendicitis. Being in no physical condition to deny any request, [Mrs. Hoover] quickly persuaded me to build a council, so when I got well, I had that to do. Mrs. Brooke turned to her friend Edith Macy, the head of the New York council, for advice. They decided to invite a group of like-minded women to tea at Mrs. Macy’s apartment in Washington’s Dupont Circle neighborhood. As an added incentive, they promised a viewing of Mrs. Macy’s art collection. This was a plum invitation. Mrs. Macy lived in the newly built McCormick Apartments at 1785 Massachusetts Avenue NW. The luxury Beaux Arts building had five stories and only six enormous apartments. 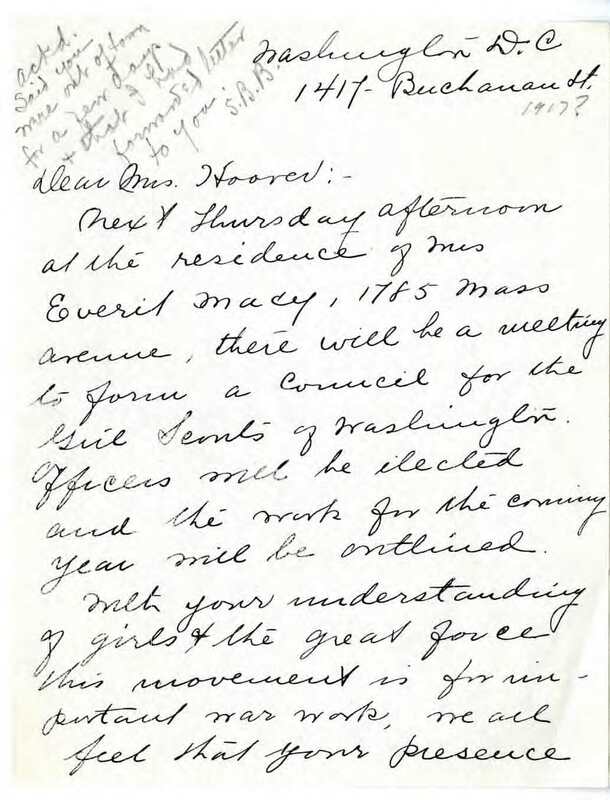 Edna Coleman, director of Girl Scouts in Washington, invited Mrs. Hoover to attend the tea, but, unfortunately, the future first lady was traveling at the time. That invitation is preserved at the Herbert Hoover Presidential Library. In any case, there was a huge turnout for the Thursday afternoon tea. About one dozen women admired the paintings, nibbled on cookies, and exchanged pleasantries. After tea was served, I simply locked the doors. 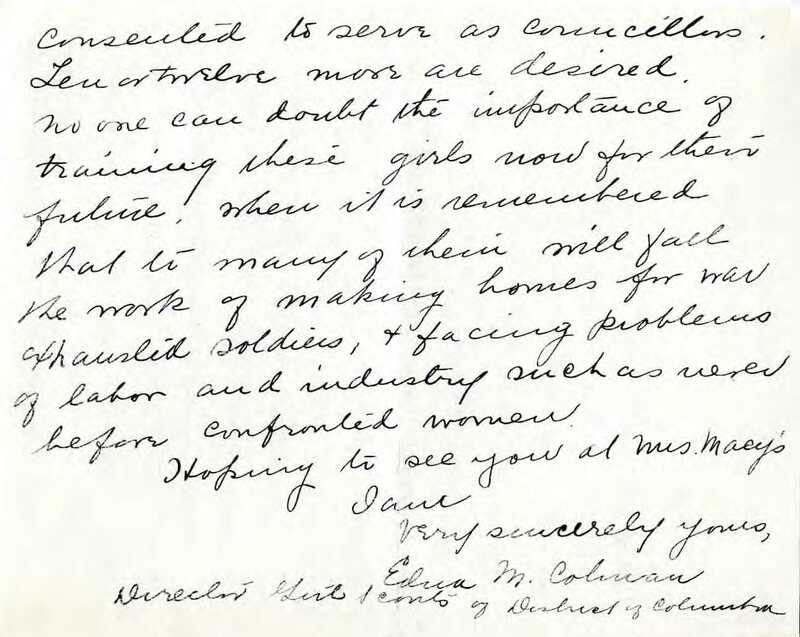 Learning that they would only be permitted to depart after accepting places on the Washington Girl Scout Council, they all accepted and always stayed in scouting. On July 17, 1917, the Girl Scout Association of the District of Columbia became the eighth council chartered by the national headquarters. From these humble and haphazard beginnings, the Girl Scouts of the District of Columbia has grown in include parts of Maryland, Virginia, and West Virginia. One hundred years later, the Girl Scout Council of the Nation’s Capital is the largest council in the United States, with over 87,000 members. We rarely kidnap volunteers anymore.